You knew he wasn’t going to keep his mouth shut forever. CM Punk has finally broken his silence and speaking up about what led him to quitting the WWE. I think it’s safe to say you can cross Punk back in WWE off of your wish list for 2015. Ten months after walking out of the WWE 30 minutes before a RAW broadcast, Punk has given his first wrestling interview where he opened up and told his side of the story regarding his WWE exile. Punk gave the exclusive to his old buddy Colt Cabana on the Art of Wrestling podcast and what an exclusive it was. Punk said the reason he quit was all due to his deteriorating health. He told Cabana that he had been wrestling with broken ribs, bad knees, and suffered a concussion at the Rumble. It had been widely reported that Punk was badly beat up around that time but I don’t think anyone realized how badly he was hurting. Punk said that he had a fever and no appetite for months. Punk also took a shot at the company and made a dig about his paychecks shrinking. I think the most damning thing Punk said about the company was in regards to his concussion. Punk said he suffered the concussion in the Rumble. Punk said he finished the Rumble with the injury. Punk said that he passed the WWE concussion test the next day, which had also been reported. Punk then said what I think could be the most damaging thing of the entire interview in that he questioned the credibility of the WWE concussion test. He called it “bullsh*t.” Punk also noted that the company showed no concern over his concussion and were more worried about him obtaining Visas and taking a drug test for upcoming tours. That is big. Keep in mind that this allegation comes just several weeks after the company evaded a potential public relations fallout from the Alberto Del Rio firing. The WWE proudly take credit for their head-injury and concussion program. Punk also brought up several instances where the company pressured him to work injured. Punk is the first major star to come out and question the authenticity of the program. It will be very interesting to see if any of the media or any of the WWE’s partners follow up on this. Maybe not, but there is potential some real fallout here. Punk took credit for the Shield. He said he came up with the idea. He said it was proposed that he be with Daniel Bryan, the Big Show, and Seth Rollins. He didn’t like that. He proposed Dean Ambrose, Seth Rollins, and Chris Hero as the Shield. Vince said no to Hero and Roman Reigns wound up in the group. He is happy for their success but was upset that all of the credit has gone to Triple H in putting the Shield together. Punk also said that he had an idea about reinventing his character. His new character would wear fighter shorts with sponsors. He said he had a big sponsor lined up that would have made him a lot of money and opened up opportunities for the other wrestlers to get sponsored. He went to Vince and Vince told him no, citing the current sponsors would get upset. As luck would have it Brock Lesnar came in a few months later with sponsors on his fighter shorts/trunks. When he went to Vince and told Vince it was his idea Vince laughed at him. He didn’t understand the difference between he and Brock and told Vince that he should have been let go if he wasn’t a superstar. He was also upset that Vince wouldn’t let him walk out with Chael Sonnen on a UFC show. He said that Vince said no and said that UFC was barbaric, he was appalled that women were fighting in the UFC, and told Punk that someone was going to die in there. Punk told Vince that Owen died in his ring. He said a week later that Triple H walked Floyd Mayweather out for his fight. Punk was not happy. He said he tried to get the finish changed for his match with the Rock at the Royal Rumble 2013 and tried to ride the title reign through Mania. Punk didn’t want to turn heel at the time but Vince told him he needed to turn heel to work the Rock. He didn’t want to turn heel so his choices were either Daniel Bryan beating him for the title or him turning heel and wrestling the Rock. 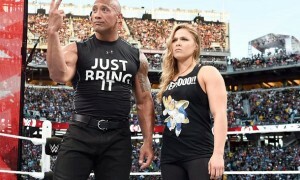 He said he suggested that they go into WrestleMania with a Triple-Threat Match with Rock vs. Cena vs. Punk. He offered to get eliminated quickly but he called it a “mind f*ck” never being in a Mania main-event. 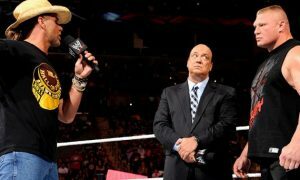 He also suggested that he retain the title and go to WrestleMania for a Streak vs. Streak match with the Undertaker. Vince turned that down. I actually blogged on that at the time and pointed out the missed opportunity between the streak vs. streak gimmick. He is also still angry at losing to the Rock and the Undertaker. The WrestleMania main-event or lack thereof seemed to be a real problem over his last year. 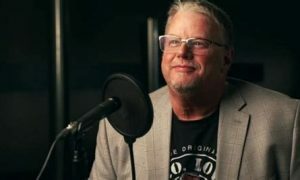 Punk told Colt that he did a lot of favors for Vince, including coming back early to work Jericho and do the program with Paul Heyman and Brock Lesnar. He said that Vince would constantly tell him, “we owe you one.” He felt that by doing a bunch of favors that he would get his Mania main-event. He said that when he watched Mick Foley’s DVD and Vince said that he felt bad he never gave Foley a Mania main-event and he did, that Vince would have the same feelings for Punk. He obviously didn’t and wasn’t going to get it and the repeated theme throughout the interview indicates it really played a big part in his decision to leave. He was also upset about a movie project falling through. He said he signed on to do the 12 Rounds movie that Randy Orton did. He said he agreed to it but had a conversation with Triple H about a conflict in his schedule. The European tour was on the schedule and he felt as champion he should be on tour. He said that Hunter didn’t think the schedules conflicted. He said that Hunter said he would check the schedule and get back to him. Punk said he then found out online that Randy Orton got the part and nobody ever informed him about it. Punk went into detail about his last hour or so in the WWE. Punk said he told Vince McMahon and Triple H he was going home. Punk then told Cabana that he told off Triple H for stifling his momentum in 2011. He also said that he complained to Vince for killing his creativity. He said he told them both that it was garbage that Daniel Bryan wasn’t in the WrestleMania 30 main-event. Punk said that he was actually fired from the WWE and he never quit. Punk said Vince was in tears when he left and hugged him goodbye. Punk said he never heard a word from him and then a few weeks later Vince text him and told him he was suspended. He then said he was delivered termination papers for a breach of contract on his wedding day. He said that the WWE were afraid he was going to go to TNA. He said that eventually both sides settled on a settlement that gave him more than what he wanted. He also said that he despises wrestling and would never go back. He said that he refused the WWE’s request to issue a joint statement on their settlement. This certainly gives a different spin to the story that was coming out of the WWE side the last several months. According to the WWE side, Punk was upset about his place on WrestleMania, didn’t want to work with Triple H and so he quit. He did confirm that it was true but it was only a part of the problem. Nothing has ever been said about his health other than he passed a concussion test the night he quit. Hearing Punk’s side of the story certainly gives me a different take on the whole situation. One thing I will say is that Punk recently blasted his fans on Twitter asking him to come back. He compared himself to Barry Sanders and said something along the lines of fans don’t care about his health. Let’s call a spade a spade here. Punk probably treats his fans worse than any other WWE superstar on the roster. There are all kinds of reports of Punk being rude to his fans. Punk himself even told fans to stay away from him in a Comic Con Q&A whereas you have a guy like Randy Orton who said on TMZ that he wants fans to know he is approachable. To each their own but he clearly separated CM Punk and Phil Brooks from his fans and when he is outside of the ring he doesn’t want to be bothered, so why should they care about Phil Brooks? At the end of the day I think it is clear that no matter what anyone wants to think, Punk is not coming back now, next year, or ever. I think it is time for WWE crowds to stop the chants and appreciate the years you had with him. Maybe he changes his mind in a few years but it would appear at this point in time that CM Punk is officially retired and retired for good.